Finn is definitively slain and the Danes head back to Daneland with Hildeburh and some keepsakes along with them. king of the troop, and they seized the queen. As if killing Finn in his own hall wasn’t enough, the Danes go whole hog and ransack the place, too. In fact, lines 1154-1157 make it sound like they took everything that wasn’t bolted down. Then they loaded up their ships and left, bringing Hildeburh back to Daneland with them. Minor spoilers for next week: this is the end of the song that Hrothgar’s poet sings. So we’ve seen, at least from this little look at the episode of the Danes’ winter with Finn, that every attempt that had been made to clear up the feud between Danes and Frisians was undone. Maybe that’s why this episode was so well known that the Beowulf poet/scribe could just launch right into it, starting off with Hildeburh’s mourning on the battlefield. Though looking back, that mourning takes on much more meaning than a single woman’s reaction to the sight of her brother and son slain in a terribly grotesque way. Hildeburh, as a peaceweaver, as a Danish woman sent to Finn to be his wife, sees the devastation of her family and realizes that the peace she was meant to broker has failed. Perhaps in that moment, as the sun rose over the battlefield and she saw her relatives so bloodily slain, she knew that any hope for peace between Dane and Frisian had ended. Going ahead to the funeral, as I pointed out in this entry we’re told that the glory of both Danes and Frisians burned up together. It’s mostly speculation (this blog’s stock and trade, after all), but where there’s glory, honour can’t be far behind, right? So, if the Danes and Frisians’ glory was gone, honour between them was likely on the way out as well. Though it must’ve lasted the winter, since Finn’s vow to the Danes that they’d be left alone as long as they stayed with him seems to have kept the Frisian lords in line until they left in the spring. But the Danes’ sense of honour towards their host and erstwhile partner in peace must’ve seriously waned. So maybe Hengest wasn’t so sympathetic with Finn as I’d imagined. Maybe, instead of Hunlafing and Guðlaf and Oslaf shoving Hengest into action, all they did was give him a gentle push. All I can say for sure is that when the Danes take Hildeburh back to her home country of Daneland they’ve effectively undone whatever peace Hildeburh’s marriage to Finn had woven. They tore that tapestry. 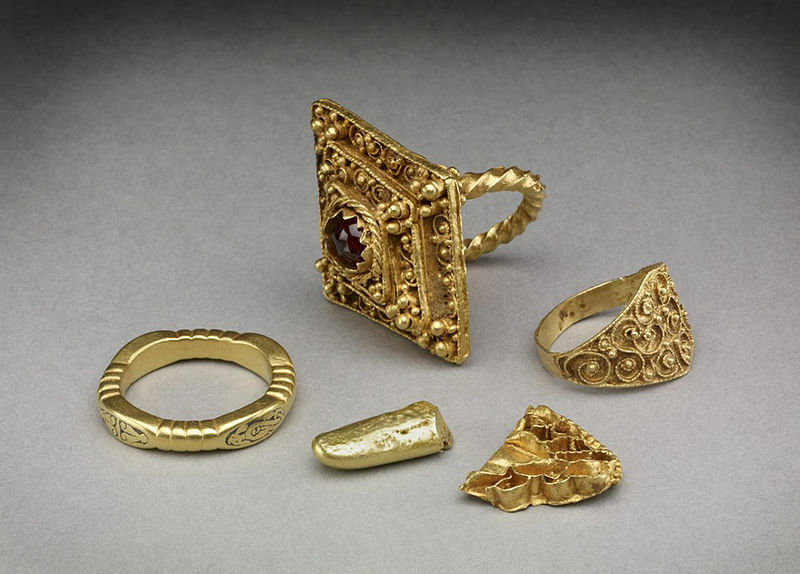 Stealing the gems was likely something for their trouble (and Anglo-Saxons loved treasure, so why not throw some of it into such a well known story? ), though their thorough-sounding stealing of the gems is also akin to running that torn tapestry through a shredder and then lighting what’s left on fire. Why do you think the Danes broke their peace with the Frisians? Because their leader, Hnæf, had been killed in battle? Or because they had to endure the tense and awkward winter with Finn? Or was it both and more? There are only two true compounds from this week’s passage that I want to point out. The other word is kind of a compound, but also kind of not. Meanwhile “ge” is a kind of intensifier (a weird quirk of old English grammar). And “in” is thankfully the cognate of Modern English’s own “in,” so its meanings are similar. So we have a word that means “in” plus an intensifier plus the verb for “to possess.” Yeah, I’d say that adds up to “household goods.” Though probably not in so far as we’d regard them as things like a coffee maker or specialized pan. I think the word refers to goods that the household had especially valued — basically, a household’s treasures. Going from marshy murk to crystal lake clear, the next word to point out is “eorð-cyning.” This compound brings together the word “eorð” (“ground,” “soil,” “earth,” “mould,” “world,” “country,” “land,” or “district”) and “cyning” (“king,” “ruler,” or “Satan”) to make a word that means “earthly king” or “king of the country.” Not much surprising there. Though it is a bit strange that the Old English “cyning” could refer to “Satan.” This little nuance gives the word “eorð-cyning” a curious tinge of greed and possessiveness. Maybe to imply (almost sarcastically?) that any king who was an “eorð-cyning” wasn’t a very high-minded ruler, but instead one who just ruled with greed and gluttony (or perhaps was ruled by them). Though jumping to these conclusions about the word is risky since “cyning” having the sense of “Satan” could just be the result of missionaries using “cyning” to refer to Satan. It could have been their way of trying to devalue and dishonour what the word stood for when the Anglo-Saxons used it to refer to excellent kings, turning them instead into rulers who held nothing but earthly power and happiness in high regard in an attempt to turn the Anglo-Saxons’ imaginations away from treasure hoards and towards some glittering afterlife. But who knows? I think the point here is that a “searo-gimma” is a gem that’s been cut in a special way, or maybe designed to be part of a larger work of art — maybe even cut into a particular shape. Whatever the case, a “searo-gimma” isn’t just some ruby or sapphire lying around, but something that’s had a bit more craft applied to it. With things like “armour, war-gear and trappings” being senses of “searo,” maybe “searo-gimma” is simply short hand for jewelled armour — stuff that would dazzle as much as it would defend. And that’s it. I think the compound words are relatively few in these, the last few lines of the song of Hildeburh and the Danes and Frisians’ fateful battle, because it’s supposed to be conclusive. As such, it’s much more straightforward than other passages about slaughter, robbery, and making off with people and booty, would be. Though maybe the Beowulf poet just didn’t want to write a poet character who was more artful with compound words than he was himself. My speculation about the word “cyning” and its carrying some sense of referring to “Satan,” comes from the idea that changing words can change thoughts. Do you think changing words can actually change thoughts? Or is that just an outmoded way of looking at how language and perception interact? Next week we get back to the celebration in Hrothgar’s hall, since the poet’s song is over. 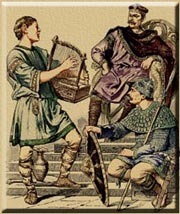 The story of Hengest and Finn continues, as Finn makes good on his promise to treat the Danes well and begins a funeral for the fallen Danes – including Hildeburh’s brother Hnæf and her son by Finn. best battler was readied on the pyre. were piled there; those few that fell in battle. that his body burn on that same pyre. There’s a quote attributed to J.R.R. Tolkien that says that the Anglo-Saxons ate too much boar and drank too much mead. The mead part of that equation isn’t present in this passage, but their passion for boar certainly is. Well, in the form of things blazoned on their armour at any rate. So what’s the deal with the boar references in lines 1111 and 1112? Well, the passage almost answers that question itself. The first reference to a boar is the “old gold boar images” on the mail and armour of the fallen (“swyn ealgylden” (l.1111)). These images of the animals sound like they were decorative, something that adorned the armour that the fallen wore rather than something worn for practical purposes. The fact that these boars are “gold” definitely suggests decoration. But then what about the “old” part? My thinking is that since Hnæf is a lauded hero, he travels with the best he could muster. If they’re all part of a comitatus, perhaps their insignia is a golden boar. Or maybe the boar image at that time was just the symbol for a certain sort of soldier. So its being made of gold, the most prized metal at the time, signifies that these are the best soldiers that the Danes had to offer. So these “old gold” boars are symbols of the fallen warriors’ status as celebrated fighters and heroes. So the boar could easily have been the symbol for great warriors of old, those who fought and fought and fought and always came back. And maybe that’s why the Anglo-Saxons (at least according to J.R.R. Tolkien) ate so much boar. Being Germanic the old German saying “you are what you eat” could well have been at work in their dietary choices. The other major thing to address in this passage is that despite the sombre tone of this funeral scene, Hrothgar’s poet still throws in some comedy. Line 1113’s “those few that fell in battle” just has to be sarcastic understatement. After earlier describing the dawn-lit battle field as a place where she sees “the violent death of her kin” (1079), there’s got to be more than a “few” that fell in battle. How else could someone so great as the hero Hnæf fall in battle? Why the poet injects this little joke here may be a matter of pride – “there’s no way the Frisians killed that many of us, we still got him to follow through on his oath (as stated in this passage’s opening – “What was promised was prepared” (“Ad wæs geæfned” (l.1107)). But the joke might also be here to dampen the military tone of recounting the soldiers and their garb as they lay on the pyre so that he can bring up the woman in mourning motif more effectively. The joke makes for a bittersweet bridge between the two, I think. Do you think the poet’s trying to lighten the mood with this joke? Is it even a joke? Let me know what you think in the comments. Because of the tonal variety of this week’s passage, and perhaps even to play down the glory angle of battle, the poet doesn’t use too many compound words. In fact, none of them relate to high falutin concepts as is usual when we hear about war and combat in Beowulf. Instead, they all relate to the body in very mundane ways. So “beadu-rinc” refers to a warrior as literally a “battle man” or a “fighting man.” This is clearly someone who’s defined by their battle experience. Which, if the word’s modern cousins like “firefighter (or fireman) or “fisher” (or “fisherman”) are any indication, is probably quite a deep and long experience indeed. Maybe it’s even referring to people whose vocation was war. Then we peer inside the warrior to get a compound word for what’s leaked out all over their torn and damaged armour: blood. There’s no doubt that the fallen warriors garments and arms are spotted or stained with blood. But I went a little further with my translation of “shiny with crusted blood” (l.1110) but I’d like to think that for the remaining Danes the blood-encrusted garb of their comrades had a certain gleam to it. That the blood dried on it was something that called out to those Danes still living and tore at their guts more than any Frisian barb about being in the service of their lord’s slayer. Unfortunately, I can’t say if the Anglo-Saxons had any theological or cultural beliefs about bones being extra important to human life, but maybe there’s something about the bones as human frame in there. So that calling someone a “vessel for bones” meant that they were just a flesh vat carrying around their bone frame, which, in a way, is exactly what a corpse is. What sort of image does the word “bone vessel” bring to mind when you hear it? Let me know in the comments. With the funeral of the fallen Danes under way, the poet next meditates on the sight of the pyre ablaze. Battleground just a Board Game? Hrothgar’s poet continues his story, as he shifts from Hildeburh to what’s happening between the battle’s commanders, Finn and Hengest. Well, by now Hildeburh has fallen by the wayside, unfortunately, as the men debate and discuss what’s to be done. So the poem’s subject has returned to the status quo. So what was even the point of showing Hildeburh mourning her fallen family? I still think it’s supposed to mirror Grendel’s mother’s reaction to the death of Grendel. And I think it’s supposed to bring a bit of humanity to what might otherwise be simply expressed in lines 1080-1081’s “war had borne away/all of Finn’s warriors, save for a few alone” (“Wig ealle fornam/Finnes þegnas nemne feaum anum”). I mean, starting with Hildeburh in mourning immediately establishes the tone of this war scene as sorrow and devastation rather than glory or action or excitement. And even though it’s not really clear who has the upper hand between Finn and Hengest in this situation, I think the poet at the least wanted to get across the direness of the battle between Finn and Hengest before it turned into just another war story. But, who is in the position of power here? Finn’s forces are apparently nearly wiped out, but from line 1090’s alliteration with “d” on “daily” and “do” and “Danes” (in the original, it’s on “dogra” and “Dene” and “weorþode”) to the end of this passage it sounds like Hengest and his Danes are at the disadvantage. They’re the ones that need to be honoured and gifted to the same degree as Finn and his Frisians. Running with that arrangement, it seems that Finn’s forces were nearly wiped out by Hengest’s, and yet Finn is the one who’s being called on to split up his wealth evenly for the time being. If Finn’s unable to take the field, but isn’t willing to admit defeat, then maybe this part of the passage shows the Danes being good sports, settling instead for hospitality rather than utter dominance. If such is the case, then it makes you wonder why the Danes are willing to negotiate in the first place. The poem in general sets up the Frisians as great enemies of the Danes, so maybe, in an effort to keep that rivalry alive, this negotiation is the Danes’ letting Finn go this time so that he and his Frisians can shore up their numbers and try fighting them again. But that makes it sound like a game. And the part of the passage about dividing the floor in half between the two groups makes it sound like it could be nothing more than a reference to a board game of some kind. Maybe something like chess or checkers. Though it would have to be a game with rules that include daily ring-giving (every turn, maybe?) and different movement rules and strategies than either of those games. Especially if dividing the board in half is some sort of special condition rather than the normal starting point of the game. But if this conflict between Finn and Hengest is just a board game memorialized in poetry, why does it begin with Hildeburh mourning her fallen son and brother? Is the poet making a joke at the expense of her grief, implying that she’s a spectator who got so involved in the game she weeps over the loss of two pieces in particular? Or is it that Hildeburh’s grieving by the morning light is another of the game’s forgotten rules? Has Hengest activated the “mourning woman” card that entitles him to these negotiations in the first place? As you’ve probably guessed this hard turn into peace negotiations with unclear sides is where this passage becomes truly mysterious, even laying aside its starting out with Hildeburh surveying the battlefield. So what do you think? Is this poem that Hrothgar’s poet is reciting about an actual conflict or just some board game match? The compound words in this passage are evenly split between matters of battle and matters of hall etiquette. Line 1082’s “meðel-stede” means “place of assembly,” or “battlefield.” It comes from the combination of “meðel” (“council,” “meeting,” “popular assembly,” “speech,” or “interview”) and “stede” (“place,” “site,” “position,” “station,” “firmness,” “standing,” “stability,” “steadfastness,” “fixity,” or “strangury”). As such, it’s pretty clear that it refers to a place where lots of people meet (or where lots of urine collects before leaving the body drop by drop, if we go with “strangury”). The jump from “place of assembly” to the specific “battlefield” seems a bit of a leap, though. Neither of the words that make up “meðel-stede” are directly related to battle, so the meaning of the compound as “battlefield” implies that the Anglo-Saxons just regarded warfare as a different kind of council or meeting. 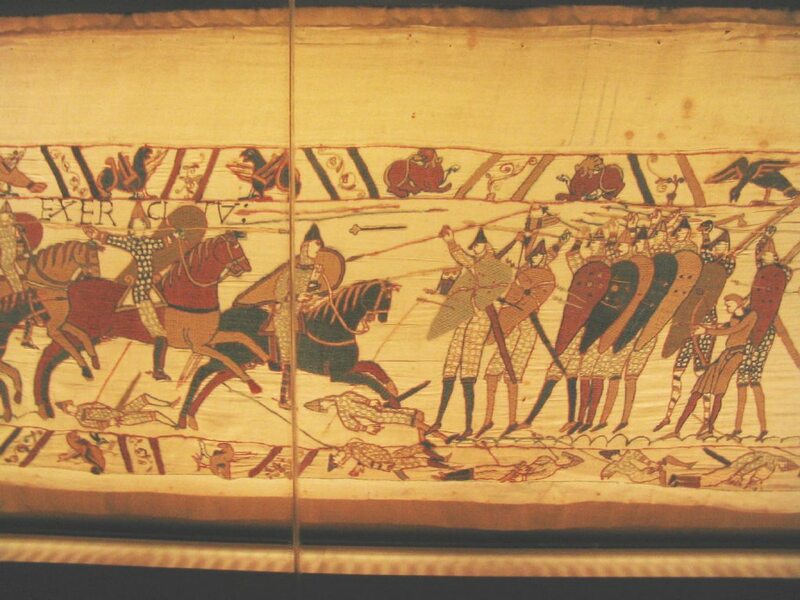 Maybe, like the ancient Greeks, and some early African peoples, war to the Anglo-Saxons wasn’t necessarily about killing but more about a kind of dramatic enactment of conflict, a kind of play with very real stakes (and very real injuries and deaths every now and then). Or, maybe the use of this compound (beyond its alliterating with the line’s “m” sounds) feeds into the interpretation of this whole conflict between Finn and Hengest being some kind of board game. Maybe the two had some petty squabble so instead of putting actual people into the midst of it, they just played a round or two of whatever strategy game was popular at the time. So the first word in “wea-laf” is a judgment of war that probably comes from the losing side rather than the winning one and the second word refers to those left behind (including the sense of a “widow,” which suits Hildeburh perfectly, and expands the meaning of the compound beyond merely those directly involved in the conflict). Together, then, “wea-laf” implies that a small group was left over after the wickedness of war swept the rest away. So there is some small, beat up group left on the losing side of this conflict. Literally, they’re those that the battle left behind. Then we move into the confines and mores of the hall. The first of the hall compounds is line 1087’s “heah-setl.” Out of context it’s a bit trickier to just see the meaning of this word, but given that “heah” means “high,” “tall,” “lofty,” “high class,” “exalted,” “sublime,” “illustrious,” “important,” “proud,” “haughty,” “deep,” “right hand” and “setl” means “seat,” “stall,” “sitting place,” “residence,” “throne,” “see,” “siege,” this compound’s senses of “exalted seat,” “throne,” or “judgment seat” are quite clear. As a “high seat,” “heah-setl” refers to the place of honour in a hall, that which the hall’s master occupies. It’s from this high seat that he would give treasure and hold audiences with guests and visitors. So splitting this power seems like a tall order, but if Hengest had really battered Finn’s forces, it might be seen as a valid request in exchange for mercy. Or as a clever stall tactic on Finn’s part. Then comes “feoh-gyftum” on line 1089. This word means “bounty giving,” or “largesse” and comes from the combination of “feoh” (“cattle,” “herd,” “moveable goods,” “property,” “money,” “riches,” or “treasure”) and “giefan” (“give,” “bestow,” “allot,” “grant,” “commit,” “devote,” “entrust,” or “give in marriage”). As a word that refers to the sharing of bounty and largesse, the intentions of “feoh-gyftum” are clear. So what can even be said about this word, really? Well, I don’t think there was a treasure that an Anglo-Saxon (Beowulf‘s main audience) loved more than one given by a great figure. It’s kind of like the change of owner wasn’t a complete action in their minds, but rather the act of transferring ownership inherently shared not just the object being given but the giver’s very essence (though perhaps “residue” is more apt). Actually, I think this sense that an object has more inherent value if it comes from someone great survived the rest of the medieval period in the veneration of saints’ relics and continues today in the high value people attach to things that celebrities have signed, used, or worn. Why do you think an item that someone great or famous has used/signed is usually seen as more valuable than the same item that’s unused or that was just used by an average person? The oath between Hengest and Finn is sealed in the next part of Beowulf. And we finally get clarification as to who’s got advantage over whom. Hrothgar’s poet begins a recitation of the story of Hildeburh, a woman in mourning. with ruinous spear wounds; she was made a mournful woman. The most remarkable thing about this passage is that it’s coming from a woman’s perspective. Hildeburh, the mother of a warrior, and sister to another, is, for some reason, near enough to the battlefield to go and see her fallen family the morning after a night battle. Her closeness suggests that this battle was probably a siege of some sort. If this is so, then she, distraught as she’s heard no word about her men, has left the city’s walls to see if she can find them herself. Though it’s also possible that Hildeburh was along with the war party as some sort of supporter. But I think that the line about “Jutish loyalty” (“Eotena treowe” (l.1072)) suggests that there’s been some treachery afoot, and so a siege is more likely. Or at least some sort of fortification. Because when I think about treachery in what’s obviously some sort of war situation, I think of a betrayal that’s resulted in the fall of a fortification or castle that was hitherto impregnable. But Hildeburh’s exact situation isn’t important. After all, the poet just launches into the story. This cold open likely comes from Hildeburh’s having been understood as a specific figure to the poem’s original audience. She’s someone who’s known to fit in with the context of the children of Finn and Hnaef Scylding, as mentioned in last week’s passage. So there’d be enough information for the poem’s early audience(s), but there definitely is not enough for us. So, instead of trying to pull more information about the situation from this I just want to jump ahead a bit in the poem. After I’ve jumped back. Grendel was defeated the night before the celebration at which this poet is singing. The monster’s arm was torn off, and he was left to wander, bleeding, back to his lair on the fens. Later in the poem (about 200 lines from now) Grendel’s mother shows up to seek revenge for her son’s death. I like to imagine that the poet’s giving us this episode from history (or common lore) about a woman going out to find her brother and son dead is supposed to parallel what Grendel’s mother is now doing (or has recently done) in the timeline of the poem. As the Danes and Geats celebrate, Grendel’s mother is mourning. In the harsh light of dawn she’s found her son mangled and dead, having been dealt “ruinous/…wounds” (“hruron/…wunde” (l.1075-1076)). And so I can’t help but think that this part of the poem, a different version of the story found in the “Finnsburh Fragment,” is supposed to be showing us the other side of Beowulf’s great victory. Grendel, to the Danes, and to the Geats who came to stop him, was monstrous. But Grendel is nonetheless the “kin of Cain.” He’s monstrous and some sort of abomination in the eyes of god, but he still has a family – a mother. And now that mother is grieving, angry. But her rage comes out 200 lines down the road. Right now we just have Hildeburh. Who, even on her own, makes a curious statement about all of the war and violence in the poem so far. Showing the mourning side of battle adds the dimension of empathy for the fallen and their living relations that up to now hasn’t really been that big a deal. But now we get to see just how that empathy plays out as Hildeburh’s part continues. What do you make of a battle-celebrating poem like Beowulf‘s having a character mourn those freshly lost in battle? Is it a balancing element, just a token inclusion, or something else entirely? This is definitely a passage about battle. Though it’s coming from the side more familiar to most of us – that of the spectator, the person who doesn’t fight but has to live with what comes of fighting. Nonetheless, there are quite a few compound words used here, considering the length of the passage. What’s particularly notable about these compound words, though is that their use is fairly measured. For instance, the poet doesn’t throw down a few compounds for the same thing or concept in short succession, nor do these compounds appear in parenthetical clauses that aren’t really part of the passage’s main ideas. In fact, in this passage, the compound words generally are the main ideas of the sentences, or at least integral to understanding those ideas. I think this measured use suggests a more focused sort of intensity than that which we’ve seen when the poet is simply slamming down compounds. But let’s take a look at these words. On line 1073 we’re given “lind-plegan,” an innocent sounding word for “battle” that literally means “shield play” (since it combines “lind” (“shield (of wood)”) and “plegan” (“quick motion,” “movement,” “exercise,” “play,” “festivity,” “drama,” “game,” “sport,” “battle,” “gear for games,” or “applause”)). This word is used for alliteration, but I think it’s also a reference to the sort of close combat that Beowulf and Grendel engaged in just some 300 lines ago. It’s tempting to read the “sceaft” in “metod-sceaft” as the usually prefix-less “sceaft” meaning “staff,” “pole,” “shaft,” “spear-shaft,” or “spear.” I mean, this reading gives us a word that would mean something like “the spear of God,” an apt sounding metaphor for fate. Not to mention taking this compound to mean “spear of God” sees Hildeburh suffering the same sort of wound that killed her brother and son. But, I don’t think that pre-fix resistant “sceaft” is the word meant here. Instead, there’s a similarly written word that does take prefixes, “sceaft” (“created being,” “creature,” “origin,” “creation,” “construction,” “existence,” “dispensation,” “destiny,” “fate,” “condition,” or “nature”). When this word combines with “metod,” we get the much clearer “God fate,” or “decree of fate” (extrapolated from “Measurer of fate”). Though I’m not sure what the mixture of a name of god and a word for “creature” or “fate” really implies in Old English. And breaking down “morthor-bealu” doesn’t do much to make the word’s implications less violent. On its own, the word “morthor” means “deed of violence,” “murder,” “homicide,” “manslaughter,” “mortal sin,” “crime,” “injury,” “punishment,” “torment,” or “misery”; while the word “bealu” means “bale,” “harm,” “injury,” “destruction,” “ruin,” “evil,” “mischief,” “wickedness,” “malice,” “a noxious thing,” “baleful,” “deadly,” “dangerous,” “wicked,” or “evil.” So we’re left with a double whammy of “murder” on the one hand and “destruction” on the other. It’s definitely a compound word that connotes inescapable violence. But, just in case we weren’t sure about the fate of Hildeburh’s kin, we’re told through “morthor-bealu” that they met a “violent death” or “murder,” suggesting that even within the realm of warfare, their deaths were particularly grisly. Unless the poet, along with keeping up with alliterating, also wanted to give us a sense of the shock and horror that Hildeburh is likely feeling when she sees them in the dawn’s light, rather than the stoic male perspective we’ve seen the poem through up to this point. All three of this week’s compound words alliterate with the major sound in their lines (“lind-plegan” with “l”; “metod-sceaft” with “m”; “morthor-bealu” with “m”). Do you think that’s important at all? In the next passage we’ll find out what happens in the aftermath of the battle in which Hildeburh lost her son and brother. The poet describes the joy and noise of the hall before diving into a summary of a tale that’s about to be told. You know there’s not a lot happening in an old poem when there are bits like this passage. What makes this passage such a red flag for a low ebb of action? The lack of specificity for starters. Until the next part of the poem (another poem within a poem) is described, we’re just told how the Danish commanders are regaled while song and tale telling are happening all around everyone. It’s also clear that this is a bridge sort of passage because immediately before hand we had some wisdom dropped on us. It wouldn’t surprise me if before this passage was recited there would usually be a little harp solo. It’s just the appropriate time for that sort of thing. After all, things are going to get heavy again fairly soon, and the end of this passage is the warning for that. I mean, before we even get into the poem that’s about to be recited, the poem itself is telling us that the children of Finn will meet calamity and the Danish hero Hnæf Scylding will meet his end. So a little solo and maybe a re-enactment of the celebration would help. But the story that follows this passage is definitely something inserted, a kind of gem embedded in the woven metal art piece that is Beowulf. Perhaps it was a lovely poem that was much admired when Beowulf was being composed, maybe even just a piece of poetry that came to a poet’s mind after having told his audience about the gifts Beowulf and the Geats got. Whatever the case, the coming story is offset explicitly like the story of Sigmund and the dragon told the morning after Beowulf’s victory. So we can tell that spirits are indeed high since Beowulf’s been fêted before with this kind of embedded story. Likewise, the tale of Sigmund foreshadows Beowulf’s own fight with a dragon, and we can expect more foreshadowing from this passage. Though it’s not likely to be as clear. Because all of the names and roles in Anglo-Saxon society can get a little tricky. And this poem is, if nothing else, historical and political, so it’s trying to exemplify something political and social. If the story of Sigmund is like Shakespeare’s The Tempest, the story of Finn’s children and Hnæf Scylding is like Titus Andronicus or Julius Caesar. It’s a neat yarn, but only really interesting if you’re already familiar with the history or are interested in it. And, actually, given that this is something with a little more grounding in history than Sigemund’s fight with the dragon, it’s interesting how the poet doesn’t really try to hook us with any special detail about the story. Before the Sigemund story we’re told that the poet brought stories of Sigemund from far off lands, but here we’re explicitly told that what we’re about to hear tell of calamity and death. But I think that’s just part of mustering authority. The poet’s introduction to what’s about to be recited needs to be simple and clear to set the tone of what’s to come and also to make clear that this isn’t an embellishment or grand story, but a retelling of facts. Plus, most people hearing Beowulf, or even reading it, would probably be familiar with the calamity that befell Finn’s children and Hnæf’s end, so things are primed as being familiar rather than new. What’s to come is history rather than mythology, after all. Though, maybe that’s why history feels boring to a lot of people. Even if we don’t know the details, the stories within history are familiar because we’ve heard the archetypal historical stories before (stories of people in war, of intrigue, of the ambitious). But works of fiction (or mythology) seem fresh and new because there’s the promise of a story we’re unfamiliar with – including twists and surprises that we aren’t expecting. What do you think makes a good story? Something unlike anything you’ve ever come across before, a regular story with a twist at the end, or something that’s mostly familiar? Why? Well, because this passage is leading us into history, things get pretty serious by the end of it. But that doesn’t mean they don’t get the poet revved up to use a bunch of compound words. We get four here, including one that must have been made up specifically for this occasion. However, none of these compounds are particularly deep or complex. So perhaps the excitement the poet feels as he gets ready to launch into a little history isn’t as unbridled as it’s been in the past but is more like the excitement of a professor about to lecture on her favourite subject. Anyway, the four compounds we come across in this passage are “hilde-wisan” (l.1064), “gomen-wudu” (l.1065), “heal-gamen” (l.1066), and “Fres-wæle” (l.1070). The word “hilde-wisan” means “commander.” Though I think “veteran” works, too. After all, “hilde” means “war,” “combat,” “keeping,” “custody,” “guard,” “protection,” “loyalty,” “fidelity,” “observance,” “observation,” “watching,” “secret place,” “protector,” or “guardian”; while the Old English word “wisan” means “leader,” or “director.” So combining the two gives us something like “director of combat,” or “leader of protecting,” which sounds like a veteran or commander to me. Of course, I think that goes without saying since all commanders would likely have been veterans (though not all veterans would be commanders). Line 1065’s “gomen-wudu” is probably the neatest compound of this bunch, and quite appropriately so. This word means “harp.” It derives that meaning from “gomen” (“sport,” “joy,” “mirth,” “pastime,” “game,” or “amusement”) and “wudu” (“wood,” “forest,” “grove,” “tree,” “the Cross,” “Rood,” “wood,” “timber,” “ship,” or “spear-shaft”). So literally, this compound for “harp” means “mirth wood.” I rather like how how the mirth is focused in the wood. Not because it takes the emphasis off of the skill of the person playing the harp. But because it suggests that the musician playing the harp is more of a medium than someone actively creating music, that they’re someone through whom the music flows rather than someone who just plays. Which makes sense since, in a joyous meadhall where its namesake alcohol is freely flowing, I imagine the harp player would get pretty into their playing. And it’s really cool how the compound reflects that. Though Clark Hall and Meritt drily define this compound as “social enjoyment.” But I think that definition makes the compound sound like it’d be more comfortable in a piece of Old English sociology rather than Old English poetry. This word must be unique to Beowulf because it’s just the name of a group of people – the Frisians (“Fresan” in Old English) – and “wæle,” which we’ve encountered before (which means “slaughter” or “carnage”). Hence, “the Frisian slaughter.” It’s not a very complex compound word, nor is it one that allows for a lot of misinterpretation, but it’s definitely something I take as a sign of the poet’s transcendent sort of state at this point in the poem. What’s your take on “Fres-waele”? Is it used just because it’s a word? To alliterate? Or to show how the poet’s beside himself with excitement? In the next passage we’ll start to get a sense of what this Frisian slaughter, and the matter of Hnæf Scylding are really all about. The poet describes the helmet Beowulf’s given in more detail. And we see Hrothgar hand over eight horses — one of which is quite special. craving comes over the blade. with a saddle skilfully coloured, a worthy treasure. The poet must’ve gotten excited about the mention of the four treasures Beowulf’s given or for the opportunity to weave more words about war, because this passage is particularly rich. Despite that, I’m just going to focus on one word. In line 1031 “walu” appears in reference to the helmet that Beowulf was given. As part of the description of this wondrous bit of headgear, the “walu” is understood as a kind of ridge which sounds like it gives a little bit of extra protection from blows. That it’s wound about with wire suggests that maybe part of this protection comes from the tightness of the bunched up wound wire in much the same way that a properly wrapped turban is supposed to protect from the downward slice of a sword. Though the wire and the ridge must be working with the basic metal hat-ness of the helmet to begin with. Anyway, the point is that this first use of “walu” is used to refer to the helmet’s extra protective properties. It’s not just any old helmet, but one that’s specially designed to protect your head in the heat of battle (beautifully expressed as “when the wicked/craving comes over the blade” (“þonne scyldfreca/ongean gramum gangan scolde” (l.1033-1034))). This instance of “walu” also alliterates with line 1031’s “wirum” and “bewunden.” In fact, as the first word after the caesura, “walu” bridges the two half lines, making (at least to my ear) for a faster paced line when it’s spoken. The second instance of “walu” comes in on line 1042. Here the word takes on two meanings. First is the geographic sense that Clark Hall and Meritt provide with their definitions of the word as “ridge,” or “bank.” I understand that this definition fits the line’s meaning because a ridge or bank could easily be the strongest part of an enemy’s (or your own) line in battle, and so the spot likely to have the most intense fighting. Even if it wasn’t the strongest, a ridge would certainly be a spot that a military force primarily made of infantry would want to capture. After all, fighting uphill is much more difficult than downhill when you’re mostly engaging in mêlée combat on foot. So, again, a ridge would likely be among the most intense sites during a battle. The other possible meaning of “walu” (both Clark Hall and Meritt and C.L. Wrenn consider a secondary meaning, referring to the word “wael”) is “slaughter” or “carnage.” I think that this interpretation has a similar meaning, it’s just much more direct about it and there’s no subtext of why there’s slaughter or carnage. But whatever the precise meaning of “walu” in line 1042, it’s possible that it’s also here for the purpose of alliteration. The line starts with “wid-cuþes wig” and then “walu” is the second word after the caesura, so it bridges the two parts of the line a little less strongly than in line 1031, but does so all the same. But even though both instances of the word alliterate, and the second “walu” is possibly just a scribal error or variation for “wael,” I find its double duty in this passage interesting because of what the echoing of “walu” with its very disparate uses suggests. The first appearance of “walu” refers to protection — specifically protection on the battle field. There’s the sense that the helmet that it’s describing provides extra protection, but hidden in there is also the sense that a ridge is a fairly safe place in a medieval battle (or so I’d guess — being higher ground and all that — arrows not withstanding). But then, on line 1042 the same word is used to denote a place that lacks safety both because it’s a hot spot during battle (definitely a place where the “wicked/craving comes over the blade” (ll.1033-1034)) and because in the context of the poem it refers to the spot where the celebrated Hrothgar is rampaging. So “walu” is used in practically opposite ways within the same passage — within 12 lines even, and I think that this is at least the scribe trying to throw in a micro-commentary about war. Namely that war is only ever safe for the victors, but that those victors imperil themselves in the process of winning both physically (usually having to fight through the toughest spot) and also spiritually since they gain a fearful reputation for cruelty on the battlefield. It’s not as heavy handed as you might expect from a medieval Christian scribe writing out a pseudo-pagan poem, but I think it’s there. But what’s your take on this? Is “walu” used twice just because it sounds good or is easy to alliterate with a lot of words? Or is there something about war being said here? I haven’t been formally recording or watching the instances of compound words since wondering if there’s any sort of pattern a few posts ago, but I think it’s safe to say that war equals compounds. Something about the heat of combat or the rhythm that the poet felt was needed in verses about fighting just seems to require compound words. This passage is full of them. They range from the simple like heafod-beorge (a mix of heafod, meaning “head,” “source,” “origin,” “chief,” “leader,” or “capital”; and “beorge” meaning “protection,” “defence,” “refuge,” or “mountain,” “hill,” “mound,” “barrow,” or “burial place” that means “prominent hill”) to “faeted-hleore” (mixing faeted “ornamented with gold” and hleore’s “cheek,” “face,” or “countenance” to mean “with cheek ornaments”) which describes the horses to things like “hilde-setl” (“war, combat” and “seat,” “stall,” “sitting,” “place,” “residence,” “throne,” “see,” “siege,” meaning “saddle”). There’s also “heah-cyninges” (meaning “high king,” or “God” — a mix of “heah,” meaning ” high” “tall,” “lofty,” “high-class,” “exalted,” “sublime,” “illustrious,” “important,” “proud,” “haughty,” “deep,” “right (hand)” and “cyning” meaning “king,” “ruler,” “God,” “Christ,” or “Satan”) and wid-cuþes (simply “widely known,” or “celebrated” from “wid” (“wide,” “vast,” “broad,” or “long”) and “cuþ” (“known,” “plain,” “manifest,” “certain,” “well-known,” “usual,” “noted,” “excellent,” “famous,” “intimate,” “familiar,” “friendly,” or “related”)). But two of the compounds encountered in this passage stand out — even from the usual crowd of compounds I’ve been coming across lately. At first glance this looks like a logical combination, a word for “sin” and a word for “greedy” — you’ve got all the necessary parts. But then “frecu” could mean “warrior” or “hero” if it’s read as “freca.” A stretch perhaps, but synonyms and puns are wordplay staples in Modern English, so there must’ve at last been some awareness of these uses of language in Old English. So perhaps there’s a connection between the “greedy craving” which you could simplify to “bloodlust,” and being a warrior or hero. This could be acknowledgement of the cost of working in either of these roles. So this compound word doesn’t just bring two terms together to create some other word, it’s an epithet for a sword. The Anglo-Saxons were so into swords that it wasn’t enough to have almost as many words for them as the Inuit have for snow, they had to also have words that were recognized as names for swords — not just words to refer to them (like “hildebill” or “gramum”). But I digress, the parts of “scur-heard” are “scur” (“shower,” “storm,” “tempest,” “trouble,” “commotion,” “breeze,” or “shower of blows or missiles”) and “heard” (“hard,” “harsh,” “severe,” “stern,” “cruel,” “strong,” “intense,” “vigorous,” “violent,” “hardy,” “bold,” “resistant,” or “hard object”). So literally read, you could take this one to mean something like “hardened in the shower of blows” or even “violent amidst the many blows.” On the one hand, maybe this is just referring to swords in general. Or. Maybe it’s referring to things a little more broadly. Maybe this is even evidence that the Anglo-Saxons attributed actions or personalities to swords. Calling a sword (or swords in general) “hardened in the shower of blows” definitely makes me think that some of the power and agency of the sword in question are taken away from the wielder and given to the sword itself. Perhaps this denotes the Anglo-Saxons foisting something like “luck,” or even the intense violence of battle, off on the sword itself. Or, maybe “scur-heard” contains the sense that the sword is so keen (being modified by that “wicked craving,” remember) that it’s just doing the work of slashing and parrying and drawing away attacks on its own. Perhaps the name’s a hint at an early longing for an inanimate object with a mind of its own. Sounds crazy, perhaps. But legends and stories of magicians and mystics bringing statues to life (Jewish stories of the golem, the Greek myth of Pygmalion) go back quite a ways into recorded history. If you could give an inanimate object life, or foist some characteristic of yours off on one (and not be thought crazy) what object would you choose? In the next post’s passage, Hrothgar formally bestows these gifts and horses on Beowulf. And the poet comments.